An overview of agreements between Dutch university libraries and traditional academic publishers with an open access element starting in 2015. For each publisher the number of open access publications is added. On a regular base Dutch scientists opt for publishers which business model is based on pure open access. Of the major publishers the publication numbers are also available. Surfmarket is involved in the negotiations with the publishers and helps to inform scientists on the practical implications. They made a total list of almost 9.000 journals in which corresponding authors of Dutch universities and academic hospitals can publish in open access for free or with a substantial discount. This list is updated two times a year. The agreement covers all 57 ACS open access subscription titles. ACS Central Science and ACS Omega are excluded. All new articles will be published in full open access with no additional costs for the authors. A corresponding author participating in the open access program must be associated with a Dutch university or organization. The list of participating ACS-members contains all Dutch universities, including Academic Medical Centers, with the exception of Erasmus University and Tilburg University. Other partners include the FOM-institute AMOLF and Netherlands Institute of Ecology (NIOO-KNAW). At submission, the corresponding author must select the institution and use the email address of that institution. ​If an author does not use an email address of his/her institution, or does not pick the proper institution from the drop down list, the article will not be published open access. ​Did something go wrong or do you want to make an already published article open access? Contact your open access liaison ​for support. You will be able to request the article to be published in open access up until three months after acceptance. Update your ACS profile. Short instruction. This Contract disclosed the 'ACS Online Products Institional Access Agreement'. 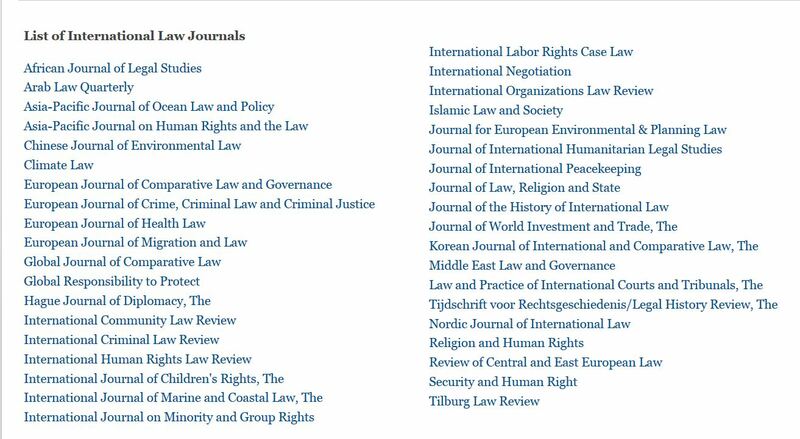 Publications published, as of 1 January 2017, in one of the 38 international Brill journals ​on Law can be published in open access with no additional costs for the first 50 articles. From the 51st article onwards the fee is €1.400 (30% discount). The corresponding author must be associated with one of the eligible Dutch universities. Eligible institutions are: University of Amsterdam (UvA), VU University Amsterdam (VU). TU Delft (TUD), University of Groningen (RUG), Radboud University Nijmegen (RU), Erasmus University Rotterdam (EUR), Tilburg University (UvT), Utrecht University (UU), Wageningen University (WUR) and Leiden University (UL). With the University of Maastricht a different agreement has been made regarding open access. The corresponding author can select 'open access' during the acceptation process. Corresponding authors have to use their institutional email address or ORCID during submission. Another possibility is contacting Brill directly at brillopen@brill.com to request to make a publication open access. More info on Brills page. There is an agreement with Cambridge University Press to publish open access in 261 hybrid and 20 full open access journals. All titles are included in the title list. A number of journals (especially society journals) are excluded from the deal, but corresponding authors can always ask if their article can be published open access without further charges. The agreement applies to all universities, except Eindhoven University of Technology (TUE) and Wageningen University (WUR). Corresponding authors must use their institutional email address during submission. After an article has been accepted, the corresponding author may indicate under which affiliation he/she submitted the article; CUP will know that the author is entitled to remission. Cleck the 'Apply Discount' button confirm open access publication. More information about agreement on the publisher's website. This Contract discloses the 'Contract form for supply of products to Surfmarket'. All accepted articles by corresponding authors of Dutch universities in the selected 396 journals by Elsevier are eligible for open access publication without extra cost. 30% of the total number of articles from Dutch universities published with Elsevier will be open access in this way. Indicate in the workflow module that your research was conducted at a Dutch university. During the negotiations on a new deal, the current agreement is prolonged with 6 months (until the end of June 2019). In this period corresponding authors of Dutch universities can also publish in open access for free in some of Elsevier's full open access journals. More info on the publisher's website. More info about the workflow. Emerald will issue 55 open access vouchers to authors at participating Dutch universities in 2019. In 2020 the number will increase to 57 vouchers. Vouchers can be used to publish an article open access in all of Emerald’s hybrid and fully open access journals in addition to the Emerald Open Research Platform. Vouchers are only available to use within journals that the participating Institutions subscribe to. Every year each of the 14 participating Dutch universities receive one extra voucher to use for publication on the EOR Emerald Open Research Platform. Unused vouchers cannot be taken forward to the next year. Upon submission corresponding authors are required to indicate that they want to make their article open access via a mandatory yes/no question. Eligible authors are identified by their institutional email address or ORCID. A list of the eligible institutions can be found on Emerald’s Open Access Partnerships page. Further information on Emerald’s open access workflow can be found here. For more info, please download the flyer: 'OA Voucher Leaflet'. This contract discloses the 'Agreement for Intermediary Services (Licensed Material) and its associated Schedules'. Nine university libraries have an agreement with Karger. Researchers affiliated with those institutions may publish at no additional cost in all Karger journals as corresponding author. Verification must be done by the participating institutions within three days after Kargers sends them a mail. Authors automatically give a CC-NC-ND 4.0.license. See Kargers website and select Netherlands in the pulldown menu to see which universities are involved. This contract discloses “the License Details page including Attachment 1, Customer and Licensee Information and The Product Terms including Schedules”. LWW’s full open access periodicals are not included in the agreement. The agreement covers: Original and review articles, systematic reviews, meta-analysis, full case reports and series. LWW will recognize the corresponding author as a researcher of a Dutch university, based on e-mail affiliation; authors should therefore use their institutional email address. Once the article is accepted for publication, the author is requested by LWW to request an APC waiver code via the university library contact. This code can be used in the LWW payment system, which allows you to publish open access free of charge. Yearly all participants together are allowed to publish a maximum of 760 articles. The corresponding author logs on to Author Services of OUP with his personal credentials. After acceptance of the article he chooses via OUP’s online licensing and payment system, Author Services for an open access license. By then choosing for refer charges you make sure that the costs will be paid by the pre-payment account of the Dutch universities. The university to which the corresponding author is affiliated has to approve this request. More information is available on the website of Oxford University Press. This Contract discloses the 'Consortium Current Content Agreement (annual)'. Corresponding authors from VSNU Netherlands universities will have their article made open access free of charge to the author. For publications in one of the 40 journals of learned societies partnered with the publisher, SAGE will ask the society for permission to grant 100% discount on open access publishing costs. Publication in SAGE’s Pure Gold open access journals is not included in the agreement. Instead, a 20% reduction on open access publishing costs is offered. A special code is required for this. See 'How does it work?' below. The agreement covers: Original Papers, Review Papers, Brief Communications, Continuing Education, Case Reports, Letters to the editor and Invited Letters. Editorials, announcements, sponsored supplements and book reviews are excluded from the deal. Sage will recognize the corresponding author as a researcher of a Dutch university, based on e-mail affiliation. Authors should therefore use their institutional email address. Upon acceptance of the article for publication in a SAGE Choice journal, the corresponding author receives an email from SAGE with the request to complete a form and return it immediately. The publisher will send you a personal message with a request to fill out a form and send it by return mail. The article is made open access without cost if SAGE receives the form in a timely manner. The form asks for a code, but you do not have to fill it out. Articles cannot be made open access after publication. To request the 20% discount for publication in SAGE's Pure Gold Access Journal, a special code is required. You can ask your library for this code. The code is requested at the time of payment of the APC. Depending on the journal, the author must answer the payment email with the code stating the VSNU agreement or, if the system allows, enter the code into the payment system and automatically apply the code. After publication, the discount can no longer be claimed. SAGE published this information of the Dutch deal. There is a maximum of 2,080 items. If this number is reached, the agreement will be terminated and items will no longer be eligible for open access. At article acceptance you will be asked to confirm your affiliation by choosing it in the “Special Affiliation” drop-down menu and agree to the open access copyright and license terms. More information on Springers website. This contract discloses the 'License Details including Attachment 1, Customer and Licensee Information and The Product Terms including Schedules'. The agreement is valid for original research papers about 2.300 Taylor & Francis and Routledge hybrid journals. * Please note that in 2018 there is a publication cap of 1448 articles; in 2019 of 1449 articles; in 2020 of 1551 articles. When we reach a 100 articles below the maximum there will be a notification on this website. More information on Taylor & Francis' website. The agreement is valid for 52 journals for the universities of Leiden, Groningen, Amsterdam (UvA), Eindhoven and Maastricht. Corresponding authors of these institutions receive a discunt of 25% on the APC. They do not pay € 2,500, but € 1,875 for open access publication of their article. Fill in the form connected to your university and send it to the publisher, together with the manuscript. Nine Dutch universities take part in this deal. The universities of Eindhoven, Maastricht, Tilburg and Wageningen are excluded. Effective 1st January 2016, corresponding authors affiliated with an institution that takes part in the agreement may publish primary research and review articles in open access in any of De Gruyter’s hybrid journals at a discount of 90% of the APC price. When submitting the article the author pays nothing. At the beginning of the next license year Walter de Gruyter provides participating institutions an overview of published articles in open access. Walter de Gruyter then calculates 10% of the setting. This invoice is paid by the participating institutions. Effective 24th of January 2017, all Dutch universities are members of the open access Institutional membership. Under the terms of the agreement the members are entitled to benefit from a 20% discount on open access fees for pure open access publications. The portfolio consists of over 500 open access peer-reviewed journals, books and bookchapters. Upon submitting the article the author should use the email domain of the institution. Walter de Gruyter first checks whether an author is eligible to publish the article in open access (i.e., whether the institution has a subscription used in the journal and if the corresponding author uses the email domain of the institution). The publisher then askes to confirm the affiliation by sending an mail to the institution's open access contact person. An agreement between Dutch universities and Wiley starts as of 4 March 2016 on open access publishing in 1400 hybrid journals. Corresponding authors of Dutch universities should indicate, when their article has been accepted, that the article must be published in open access. This goes without extra charges for the authors. Wiley also publishes 60 full open access journals; those are not covered in this agreement. Once your article is accepted, register or log-in to Wiley Author Services. On your Author Dashboard in Author Services, click ‘Order OnlineOpen’. If your request is approved, you will receive a confirmation mail. Use the email address of your institution at any time when having contact with Wiley and during the submitting process. Wiley uses this address to detect if you are eligible for this deal. In doing so during the submitting process you will get the information you need to make the publication available in open access without additional costs. ​Some Wiley journals use a different workflow. Please contact your university contact person in case you need more information. See the flyer "How to Order OnlineOpen"
This contract discloses the 'Wiley Online Journals License'. Emerald will issue 30 open access vouchers to authors at Dutch universities in 2017 and in 2018: 45 vouchers. These vouchers can be used for all journals issued by Emerald and can be requested via the open access contact person at the library of the respective institute before the acceptance of the article. The contact person will then submit a request to Emeralds accountmanager Sonja Spretis. The Emerald open access workflow visually presented. Gold for Gold is a scheme established by the Royal Society of Chemistry (RSC) that rewards all institutions that subscribe to RSC Gold subscription package with vouchers to make articles open access, free of charge. 11 of the 14 Dutch universities are using the Gold 4 Gold vouchers. Researchers who want to use one, please contact the open access contact person within your university. The deal with the Royal Society of Chemistry (RSC) has ended on 31 December 2017. For 2018 negotiations are going on. RSC has suspended the discount and the deals for open access free of charge with the universities of Eindhoven, Delft and Leiden. Dutch researchers of all universities have to pay the full open access amount (APC) until an agreement is reached on this point. It is uncertain when that will be. Dutch university staff is able to publish open access in 150 selected journals as corresponding author. They will be notified automatically by SAGE on the basis of their email. The domain name of the university has to be present in the email. The notice will include an open access license form. After receiving a filled out form the article will be published with a CC.BY.3.0 license in SAGE choice. Dutch corresponding authors are able to receive a substantial discount. In 2016 they can publish their article for 200GBP/375USD in open access in other SAGE journals. Do you want to be eligible for this discount? Please send a standard license form to the editor of the journal after your publication has been accepted on whick you notify her/him that you want to publish in open access- SAGE Choice. You will be sent the SAGE Choice OA license. to use this discount, you have to fill in code "UKB90" on the SAGE Choice form. More information on the SAGE OA-website and the VSNU website. Link to the contract (this version of the contract discloses “the License Details page including Attachment 1, Customer and Licensee Information and The Product Terms including Schedules”). Articles by corresponding authors from Dutch univerities and the KNAW will be published in open access, at no cost to the author. The agreement applies to some 1,700 journals within the Springer OpenChoice programme, with the exception of titles from learned societies, BioMedCentral and SpringerOpen. More information on the Springer website. There is a maximum of 2,200 items. If this number is reached will terminate the agreement and items will no longer be eligible for open access. All new articles in 57 journals are published open, without costs to the author. Free publishing for the first 50 articles and discount from the 51st onwards. Hybrid as well as full open access journals are included in this deal. No publishing costs for Dutch authors at 400 Elsevier journals. Vouchers can be used for publication in open access of one article in all journals issued by Emerald. The vouchers are valid for hybrid as well as full open access journals. No publishing fee in all journals for authors of 9 Dutch universities. Waiver codes for more than 200 hybrid LWW journals. Publish without costs in over 700 journals. Publishing in 1,850 journals at no cost to the author. Free of charge publishing in 2,300 hybrid journals, under the CC-license of your choice. A 90% discount on publishing in hybrid journals. This deal applies to 1,400 hybrid journals. This publisher offers vouchers for open access publishing. For more specific information contact one of the open access contacts at your university and those responsible for the verification of authors in the submission process for universties and university medical centers. This list has been carefully composed. However, Openaccess.nl is not reponsible for, and expressely disclaims all liability for, damages of any kind arising out of use, reference to, or reliance on any information contained with this title list. While the information contained within the site is periodically updated, no guarantee is given that the information provided in this webpage is correct, complete, and up to date.